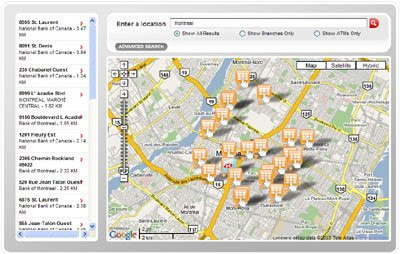 HSBC Bank Canada have produced a Google Maps mashup to help customers locate bank branches and ATM’s. The map allows users to enter any address and find their nearest HSBC bank or ATM machine. It is possible to view both banks and ATM markers on the map or select to view just banks or just ATM’s. The locations are shown both on the map and are listed in a sidebar. When you click on a bank or ATM marker it is also possible to get driving directions. BNZ Bank in New Zealand have also produced a Google Map that shows the locations of bank branches and ATM machines. The map helps customers discover branch opening times, branches with wheelchair access, drive thru banking sites and ATMs where you can make deposits. It is possible to search the map for any location in New Zealand. The map also uses innovative marker clustering on the map which is reflected in the map sidebar. The cluster markers show how many branches there are in a particular location and the cluster markers are displayed not only on the map but in the sidebar.